Do you want to enjoy your favorite music in the pool or the shower? Bringing your phone with you is not a good idea. A Bluetooth speaker solves the problem, except most Bluetooth speakers are not waterproof. Enter the Superstar Backfloat from Monster. This thing is completely, 100% waterproof. You can take it swimming with you and best of all – it floats instead of sinking to the bottom! 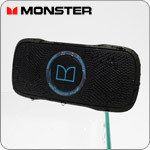 The speaker has a protective shell made of all-weather silicone that is extremely tough. The whole speaker is 2x larger than the original Superstar Bluetooth Speaker, which provides a wider Stereo array for more room-filling sound. The speaker will last over 7 hours at 50% volume and sounds great whether it’s standing or lying flat. The Superstar Backfloat goes on sale in early 2015 with an MSRP of $169.95. This entry was posted in Audio, Gadgets and tagged 2015 CES, Backfloat, bluetooth speaker, Monster Products, Superstar, Waterproof, wireless speaker by Trevor Freeman. Bookmark the permalink.